On February 19, 1847, rescuers reached survivors of the Donner Party, a group of pioneers trapped in the frozen Sierra Nevada Mountains for almost four months. 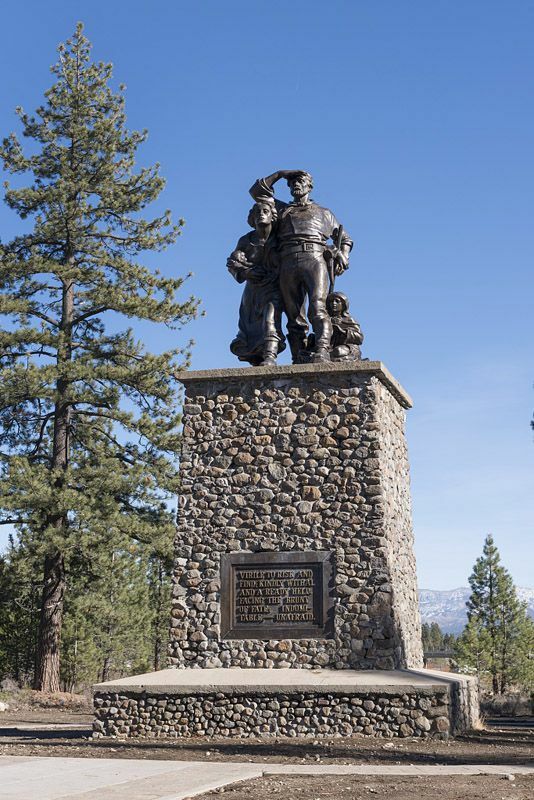 This memorial to the men, women, and children of the Donner Party stands near what is now Donner Lake, California. The top of the monument (where the statues are standing) marks the depth of the snow endured by the party in 1846-1847. On February 19, 1847, a team of rescuers reached survivors of the Donner Party, pioneers trapped in California’s snowy Sierra Nevada Mountains for nearly four months. The Donner Party had made crucial mistakes from the beginning of their journey. They were one of the last groups to leave Independence, Missouri, on the famous “Oregon Trail” in 1846. With more than a dozen children, several senior citizens, and at least two members of the party ill with tuberculosis, their wagon train traveled unusually slowly. Most importantly, the party chose to take an ill-advised “cutoff” across the Great Salt Lake Desert and Wasatch Mountains. This brutal summer trek through the Great Basin delayed the group even further and cost them oxen, wagons, food, and belongings. When the Donner Party finally reached the Sierra Nevada—the final obstacle in the trip to California—they were met with one of the most severe winters on record, and most of the party could not continue. Several men left their families to seek help at Sutter’s Fort, California, which stocked supplies for pioneer groups. When the men returned with the first of three rescue parties, what they found was tragic. Most surviving pioneers had resorted to cannibalism. Driven to desperation, members had killed two members of the party for food, and then taken advantage of others who had died of starvation, malnutrition, or frostbite. About 90 pioneers (families, workers, and guides) began the journey. Only 48 survived. organism that eats the meat of members of its own species. extreme, urgent hopelessness and sadness. enormous watershed region in the western United States with no drainage to the ocean, including most of the state of Nevada, and surrounding areas in California, Oregon, Idaho, and Utah. infectious, sometimes deadly, disease of the lungs. group of pioneers traveling in covered wagons, often those emigrating to the American West in the 1800s.